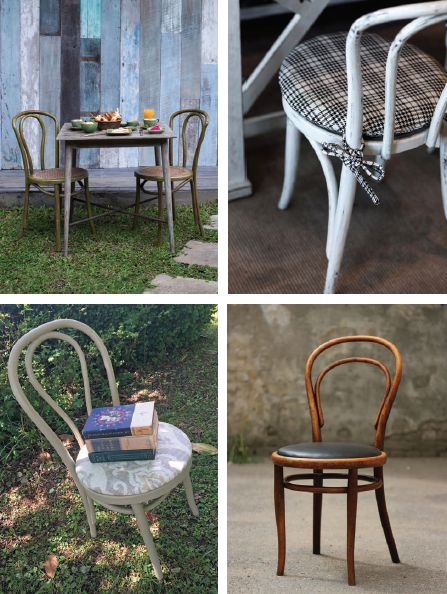 The classic cafe chair, with its distinctive bentwood frame and “hairpin” backrest, has been a fixture of European and South American bistros and sidewalks since the 1850s. First invented by Viennese carpenter Michael Thonet by using steam to curve beechwood, its graceful, lightweight frame was a radical departure from the hefty, ornate furniture in vogue at the time, and its popularity was instant and widely imitated. Its perennial charm and functionality makes the cafe chair a versatile style that can be used in many of today’s spaces. Portable and paintable, it provides attractive additional seating for dinner parties and soirees. Tuck one or two into a breakfast nook or banquette. Enliven an empty wall with a chair and side table vignette. Add inviting appeal to your porch or garden destination with cafe chairs in pastel or vibrant hues. Equally inviting solo or in sets, this space-saving furnishing is an easy keeper.